A powerful new way to do SEO – putting a real ranking advantage in your hands! CORA is desktop software for Windows & Macs. It is an SEO factor measurement tool that measures over 540 on-page & off-page SEO factors (and counting). It measures the top 100 results for your search terms and puts all the measurements, recommendations and charts into an excel spreadsheet. 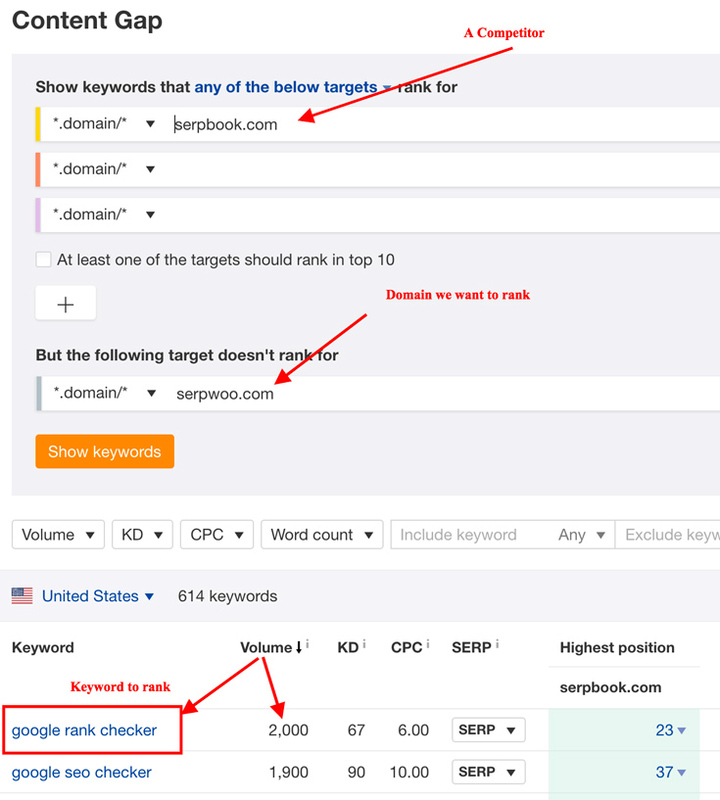 I ran an Ahrefs report and found out that their competitor SerpBook is trying to rank for search term “google rank checker”, their currently in position #25, while SerpWoo is no where to be seen. Now lets assume serpwoo.com decided to rank for the search term “google rank checker”. Lets fire up CORA and run a report! 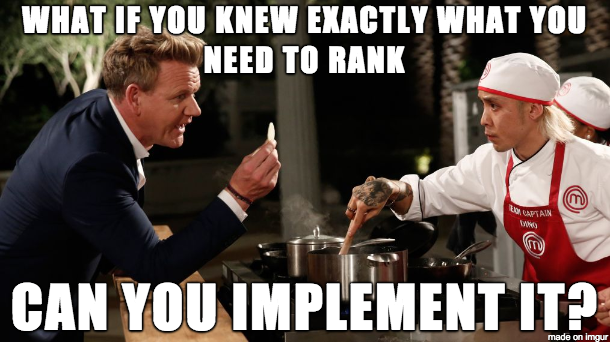 If you don’t rank in top 100, CORA will still compare your specified URL to all other results! CORA will scrape the top 100 results, comparing over 540 onsite and offsite factors across all the sites. It then plots the data into charts and tables, comparing and analyzing the factors. In this case, CORA’s charts found that both factors “keywords in button tags” & “search terms in body tag” are ranking factors. The X-Axis represents Google pages. Y-Axis represents Average factor measurement by page. Bam! 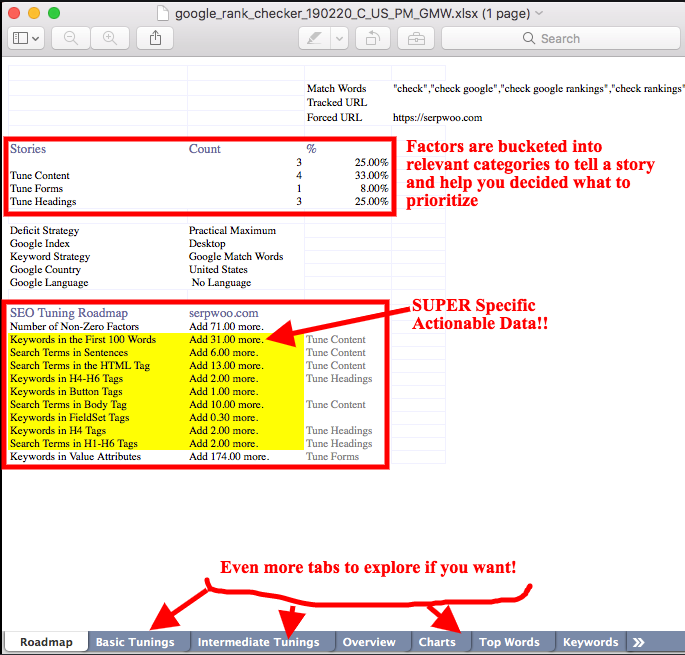 Actionable data that you can implement for a quick SEO boost AND you got this in just minutes! Each line is a different ranking factor. There are 540+ ranking factors that we look at (and growing). For the factor to be included in the report (it has to have both a strong correlation with rankings + you have a deficit in it). The advice is that specific!!! The report gets into a lot more details - there are 10 other tabs within the spreadsheet full of data but we don’t have time to get into all that. In this case, we already know SerpWoo is not ranking mainly because they don’t have a dedicated page for the search term “google rank checker”. If they were to rank though, all they need to do is get a page based on the advice in the road map or implement the advice on their homepage. But wait… You think this is great? Lets say they outsource their content and their writing team doesn’t understand what is written in the road map report! Maybe we want to make it easier for them to understand? No worries. Lets fire up CORA Page! (an extension to CORA) and import the report we got from CORA above! Boom! An article that emulates what your page should look like! (All based on factors CORA detected as ranking factors). Its populated with spun content but will help guide the writers understand what is needed. CORA Page, CORA Trends, CORA Keywords ,CORA Diff, CORA Outreach and CORA Correlate Anything. I will not go into the other tools now, but they are just as powerful! STOP GUESSING - START CORRELATING TODAY! To celebrate the launch of this thread and prove the power of CORA. I am giving away 15 FREE CORA REPORTS TO BUSO MEMBERS WITH 1YR+ OLD ACCOUNTS AND 100+ POSTS. The free report is contingent on you posting a before/after screenshot. Nothing too fancy! Maybe a before/after of the rankings. You can obviously blur out the exact search term your trying to rank for. I’d be happy to take one of those reports, got a few pages that need some help. Does the software work with UK serps? I mean I sell a small army of competing products, but I'd be happy to give it a review. My site got hit by Medic last year so I suspect that my main problem is that I need more authoritative links, but I would be interested in a report for one of my money articles. I'm just here to say that CORA is amazing. The reports are crazy detailed and it makes on-page a breeze. Highly recommend everyone competing for tough keywords gives it a try. Would have sent you a copy but I am looking for 1YR+ OLD ACCOUNTS AND 100+ POSTS. I can vouch for Cora, having previously used it in the last couple of years. I used to manually scrape a lot of this data myself in an effort to achieve the same thing while compiling competitive intel to optimize my sites. That always took way too much time and effort. At the end of the day, the important thing to me is getting a quick battle plan together to match and exceed the enemy. I don't need perfect. I just need to know what the "ballpark" amongst my competitors is so I can aim for that and move on to the next campaign. With Cora, I was pretty impressed with how quick and easy it was to scrape, compile, and dump a ton of data, but also useful and actionable insights. It was really nice to be able to quickly run a few reports in minutes, get a quick list together for content improvements, and then get to work! I'd like to give it a go please, will PM you. I'm in for a free report. Will shoot you over info in a PM. Does it need a win/mac computer, or can I run it on any server, i.e. a linux box or osx. Does it require proxies? Send me a PM with your details. You need proxies. It runs on both PC/MAC. Not sure about linux box but don't see why not. Asking the questions here: anyone got any SERPs before & after using this tool to prove its worth? Cool, will post a case study here when I've ran it on some sites. Will have time to set it all up this weekend. I buy sites, and improve them, so I can see a big potential for this. I also make a few new big sites this year. I've used pageoptimizer.pro which is ok, but a bit one-dimensional (it's a different product completely, but some overlap), but I like the data amount you get from Cora as I'm mainly doing paid advertising and work a lot with data and statistics there. #1) I ran a new CORA report for serpwoo. #2 I then used CORA Diff and compared the new report to the old report! CORA Diff immediately compared the 2 reports and shows me what factors changed in position (importance). Simply put, this helps you understand if you need to tune your site for any new factors and overtime helps you understand more and more about your niche. How is it different? Seems very similar. The main difference is that with POP you choose which sites you want to optimise against, obviously similar sites who are ranking well. CORA analyses the top 100 for a specific keyword, and looks at the correlations where it is likely that a ranking factor contributes to higher rankings. I’m going to post the results of my review copy later today. I updated one of my pages following the recommendation in the CORA report that I received. The keyword has 1600 monthly searches, is a best type of keyword, and has medium competition. The results look good, there is obviously an improvement. However, as with everything in SEO, its impossible to say whether the improvement is down to the CORA optimisations. In conclusion, the changes that I made definitely didn't harm the page in any way. It's just that there is no way to say if these changes were what contributed to the improvements. A number of factors such as links, domain age, page age could all be contributing factors. Perhaps someone with an aged site who isn't actively link building would be able to provide more concrete evidence. A lot are asking what the difference is between all the tools out there on the market!